Dr. Steve Manteaw, a Policy Analyst, has observed that, should Mr Martin Amidu stand as an independent Presidential candidate and become president in Ghana, he will ensure value for money and protect the public purse. He said Mr Amidu could be one of the best presidents for Ghana because he would crack the whip on his defaulting Ministers. 'Mr Martin Amidu as an independent presidential candidate who wins an election and has to draw his ministers from the brightest and best of NPP, NDC, PNC, CPP and PPP, and because he owned no political allegiance to any of the political parties, he would crack the whip on his Ministers if they misbehave'. 'And so from the scenario I have cited, Ghana will see so much progress and value for money in the way public funds are expended,' he said. 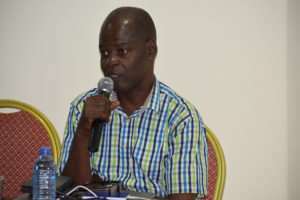 Dr Manteaw, who is also the Campaign Coordinator at the Integrated Social Development Centre (ISODEC), made the suggestion when he gave his personal assessment of the nominee in an interview with the Ghana News Agency. The vetting took place despite a pending case at the Supreme Court filed by Lawyer Dominic Ayine, challenging the suitability of the nominee in view of his old age. Dr Manteaw applauded Mr Amidu, a Special Prosecutor nominee, for performing creditably during his vetting by the Appointments Committee of Parliament and demonstrated a profound knowledge of the law, proving that he was cut-out for the job. Dr Manteaw said the nominee exhibited that, he had competence, high moral integrity and an unblemished track-record in his public life, which made him the most suitable person for the job. He noted that, those qualities were key and critical for a candidate nominated of that position, which had strengthened his conviction that Mr Amidu could deliver. Dr Manteaw said Mr Amidu qualified for the job because he had exhibited integrity throughout his public life and lived above reproach, therefore Ghana needed someone of his calibre for a position as sensitive as the Special Prosecutor. He asked government to provide the Special Prosecutor's Office with the necessary resources to execute its mandate because the legislation establishing the Office had spelt out sources of funding for it. President Nana Addo Dankwa on January 11, 2018 nominated Mr Martin Amidu for the position of the Office of the Special Prosecutor. The President subsequently presented the nominee to the Speaker of Parliament, Mr Aaron Mike Ocquaye, who also forwarded the name to the Appointments Committee of Parliament for vetting.